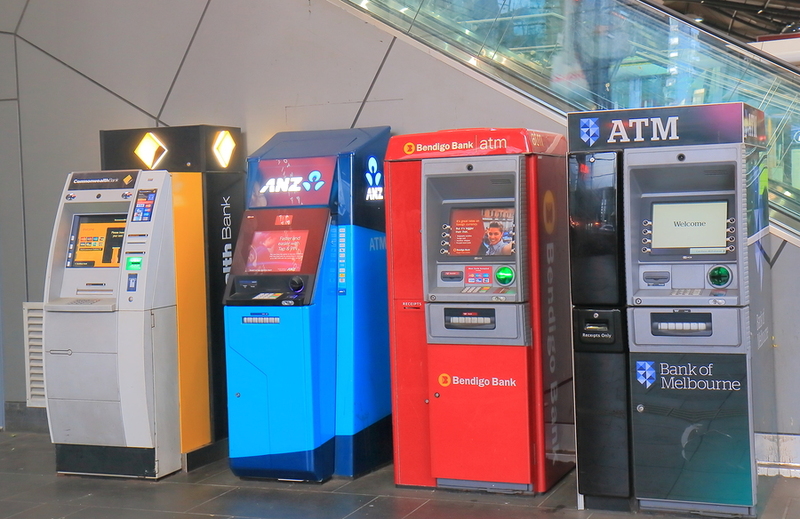 MELBOURNE AUSTRALIA – JULY 2, 2017: ATM cash dispensers in downtown Melbourne. There have been many comments online recently that may have become quite controversial among readers. The comments were related to a potential financial crisis in Australia that is being anticipated and may affect to different scenarios. It could be said that the opportunities for most classes have been distorted. With each year, the resulting unfortunate events might push the enormous country of Australia towards frightening issues on social and economic levels. The main strategy of the financial titans in Australia is to act with and rely on foreign investors. With different objectives but the same endpoint, all banks may be looking to avoid an economic disruption. That happens when the entire nation is chock-full of tough and solid businesses competing with each other for the top position, creating an unstoppable snowball effect of uneven greed. What is planned to prevent any downfall is to increase their trust and dependence on long-term whole debt markets, a new term of debt that improves funding and go for the boost that Australia actually needs. By taking advantage of the attention this whole issue attracts and the positive pricing on institutional markets, the bet is directed to the expansion and development of continuing positive income. The competition, which is international markets, is striking back and most of the time is better to act smarter and immediately. A possible threat is an attack involving promotions that pull back mortgage rate cuts. The analysis made so far encourages repairing the overall mix funding in recent years and executing maintenance on regulations that have forced banks to increase the use of customer deposits for funding. Nonetheless, new long-term debt derivation represents the 5% of the banks each year, limiting the pressure on their net interest margins. Meaning just one thing, the influence of a recent increase in bond prices doesn’t affect the banks and still adjusts to raise debt at cheaper prices than in far more unstable markets during 2012. There are whole teams working on this as the four main banks of the country announced changes that might have an impact in what is left of this decade. Australia’s economic independence is hanging on a string, considering that the real solution is in the hands of the entire community. Meanwhile, there is an air of success constantly flowing through Australia. There is still some time left and we better get prepared while deeply studying the situation. The main appeal isn’t the banks or foreign businesses but what this nation represents to them. People admire this nation because of its beautiful, multi-diverse nature, which has achieved so many things as a direct result.